For a nation that proudly declared it would leave no child behind, America continues to do so at alarming rates. Despite increased spending and politicians’ promises, our buckling public-education system, once the best in the world, routinely forsakes the education of millions of children. 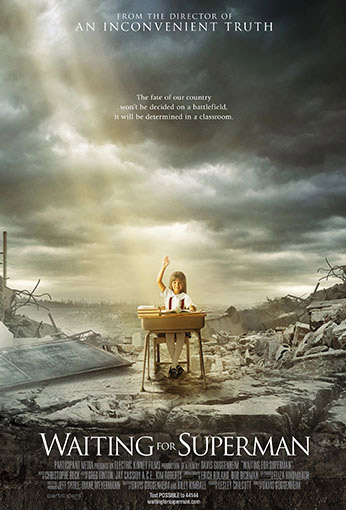 Oscar®-winning filmmaker Davis Guggenheim (An Inconvenient Truth) reminds us that education “statistics” have names: Anthony, Francisco, Bianca, Daisy, and Emily, whose stories make up the engrossing foundation of Waiting for “Superman”. As he follows a handful of promising kids through a system that inhibits, rather than encourages, academic growth, Guggenheim undertakes an exhaustive review of public education, surveying “drop-out factories” and “academic sinkholes,” methodically dissecting the system and its seemingly intractable problems. However, embracing the belief that good teachers make good schools, Guggenheim offers hope by exploring innovative approaches taken by education reformers and charter schools that have—in reshaping the culture—refused to leave their students behind.